Our Community Champions are Better Start Bradford’s biggest assets. They are rooted in their communities and provide trusted peer to peer motivation around our key aim to give children the best start in our area of Bradford. One of our Community Champions, Sundas Mughal, shares her champion journey with us. When I became mother to my son (now aged two) it put a lot of things into perspective and gave me a sense of direction. I made the decision not to return to work and become a full-time mum. I also wanted to get involved in making a difference in people’s lives but when I was working full-time, I didn’t get the opportunity to volunteer. 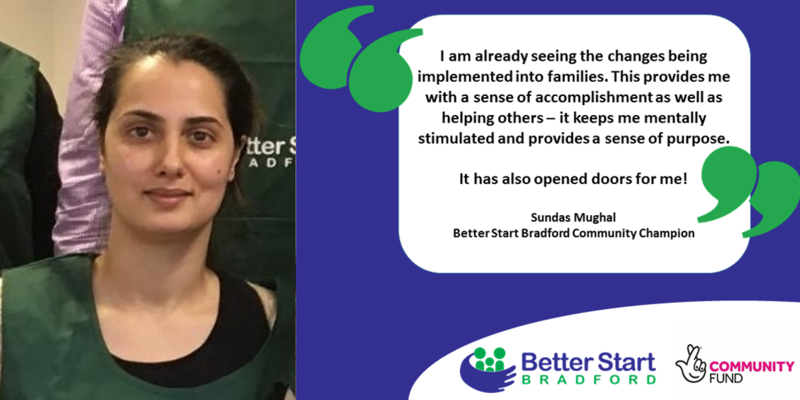 One day, I was at a baby and toddler sessions and I met Abida from Better Start Bradford’s Family and Community Engagement Team. Abida gave me an insight into Better Start Bradford and I was blown away with their focus on language and communication development, diet and nutrition and social and emotional development. I instantly wanted to get involved and as I live in the Bowling area, I wanted to be part of its heritage. I initially got involved in focus group events, then took part in recruitment days and attended the HENRY workshops. The HENRY course was very informative as it helped me to develop healthy lifestyle habits as well as increasing my knowledge of nutritional information when choosing food products. This has benefited myself and my family immensely. When the role of Better Start Bradford Community Champion became available, I found this to be a great opportunity to actively get involved and see first-hand the changes and rewards of Better Start Bradford’s vision. I work with families to create awareness and to promote the importance of small simple changes which can have a huge impact in shaping children’s lives for a better healthy future. I am gaining invaluable experience and have been involved in several events so far including a range of activities over the summer, Baby Week Bradford, which was a huge success and recently the festive fun days. I am already seeing the changes being implemented into families. This provides me with a sense of accomplishment as well as helping others – it keeps me mentally stimulated and provides a sense of purpose. It has also opened doors for me as I attended an introduction to interpreting class, which was recommended by Better Start Bradford’s Fiona Saville. As a result, I am now studying interpreting at college. I am really looking forward to continuing my Community Champion journey and working to make positive changes and support Better Start Bradford’s commitment and vision to give our children the best start in life. Are you as passionate as Sundas about working with families to make a difference to local children’s lives? If yes, then we will be recruiting for more champions this year. Check out more information about becoming a Community Champion here.